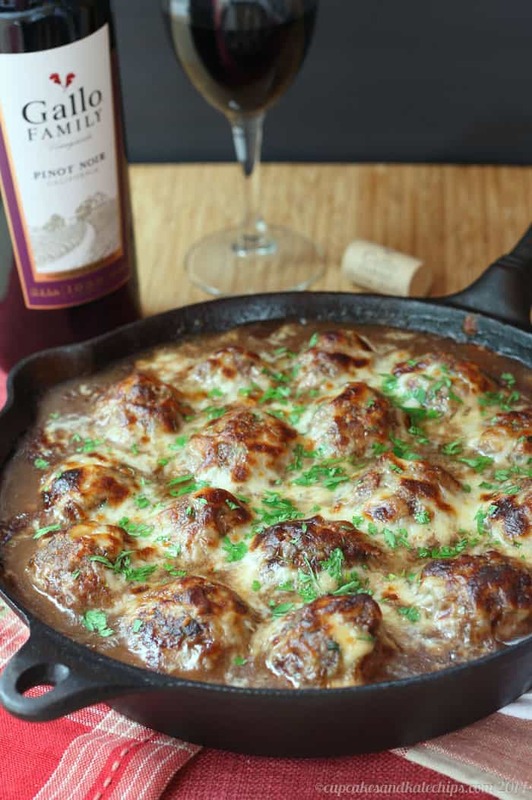 French onion soup au gratin stuffed meatballs pair caramelized onion with a cheese stuffed meatball. 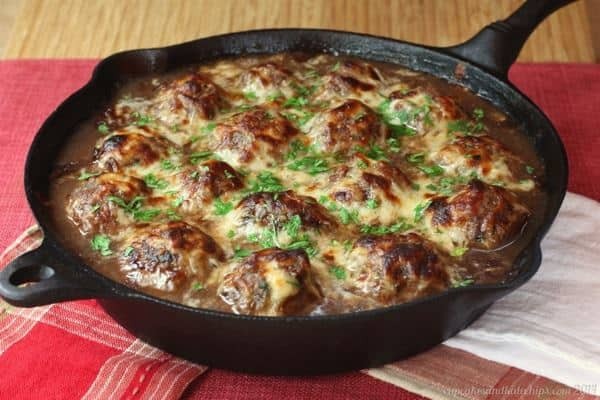 Take the best part of French Onion soup – the rich caramelized onions and ooey, gooey cheese – and turn it into a true “man meal” by making French Onion Soup au Gratin Mozzarella Stuffed Meatballs. Check out the video below! My parents got divorced when I was five years old. Strangely, most of my food memories are of the snacks and treats that I only had when I was with dad. There are the memories of polishing off an entire bag of Cheese Doodles, splitting a sleeve of Chips Ahoy cookies with a single glass of milk for dunking, and sneaking popcorn and soda from home into the movie theater. I remember stirring cook & serve pudding over the stove to make (and devour) pudding pie. There were giant bagels for breakfast, loaded with an obscene amount of cream cheese, and a carton of chocolate milk. Then, I would head back home to with my (slightly) healthier mom. I think many little kids of divorced parents get spoiled a bit when they go visit the parent they don’t live with. But I know my dad fed me meals, too. Though, the funny thing is, only two stand out in my mind. Well, except for that one time he tricked me into eating an elk burger – but I wasn’t going to recreate that). One is hot dogs, “Campfire” Potatoes, corn on the cob, and S’Mores when we spent summer evenings around the fire pit in his backyard. The other was our cold weather favorite – grilled cheese and French Onion Soup au Gratin. Because, you know, can you really have too much bread and cheese in one meal? I think not. French Onion Soup (albeit from a can), gently simmered until hot, then poured into crocks, topped with toast and plenty of mozzarella cheese (not traditional, but that’s how Dad made it), and put under the broiler until it bubbled and browned. I eagerly awaited those crocks being removed from the oven and placed on the table so that I could pierce my spoon through the gooey layers. I would scoop up a perfect bite with some of each component, drawing it towards my open mouth, thin strands of cheese slowly stretching their way from the bowl until I pursed my lips around the spoon and broke them off, sighing with delight as the aromas and flavors enveloped me in warmth and comfort and love. Since the weather is getting warmer, I am married to Mr. I (Pretend to) Hate Soup, and Dad lives in North Carolina so wasn’t around to enjoy it with me, I didn’t want to just make French Onion Soup. I wanted to reinvent it into a manly man meal. 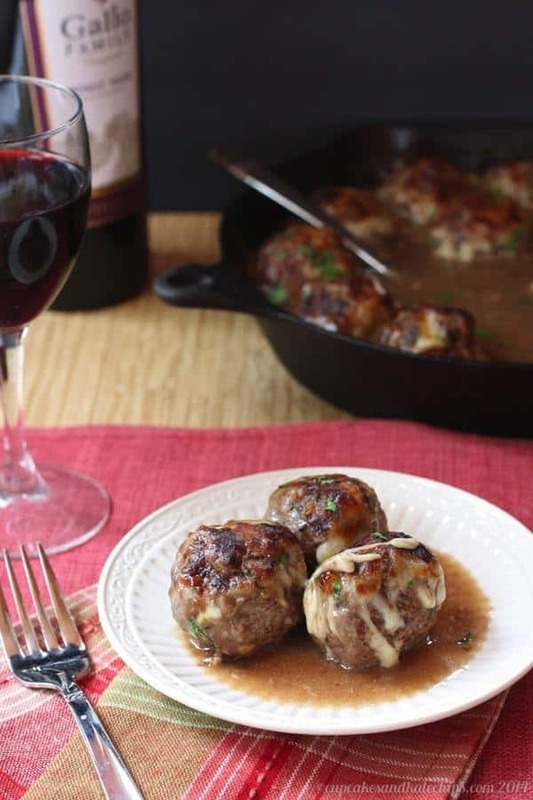 What’s more “manly man” than French Onion Soup au Gratin Stuffed Meatballs? So I caramelized some onions with Gallo Family Pinot Noir, and stuffed them with a cube of mozzarella cheese inside the meatballs. After browning, they were covered in a rich sauce (almost a gravy, but not quite so thick and heavy) of red wine and beef stock, and baked in the oven until they were cooked though and the cheese became a pocket of melty deliciousness. And of course I couldn’t leave off the au Gratin, so the entire pan was covered in more mozzarella and placed under the broiler to get that perfectly browned cap of toasty cheese. Three of the most important guys in my life – The Hubby, The Bug and Baby Smiles, went crazy for these French onion soup au gratin stuffed meatballs. I might have had one more than I really should have, too. I only wish I could have shared them with my dad. But I’ll be sure to send him this recipe if he wants to make them, and I know what will be on the menu for his next visit. 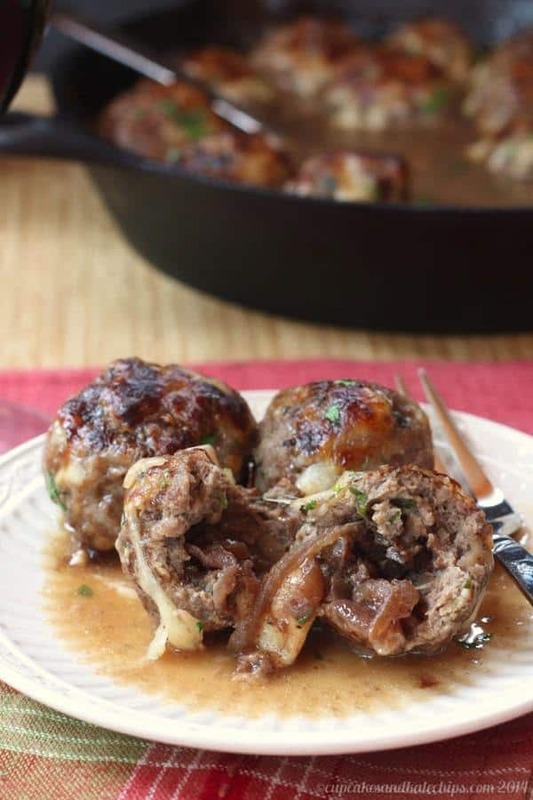 If you don’t want to roll meatballs, you can make French Onion Salisbury Steak from Nutmeg Nanny. Go for all out comfort food with French Onion Macaroni and Cheese from Dinners, Dishes, and Desserts. Or choose poultry over beef and make Cheesy French Onion Chicken Sandwiches from Wonky Wonderful. Gallo knows all about the importance of family and the meals that bring us together, and they want to help us honor Dad with special recipes just for him. And check out all of today’s amazing recipes that honor all of the special Dads in our lives at the bottom of this post! Make sure you pair these with their Pinot Noir or Cafe Zinfandel for a truly special meal. I hope you enjoy these French Onion Soup au Gratin Stuffed Meatballs! Turn the best part of French Onion soup - the caramelized onions and gooey cheese - into a true "man meal" by stuffing it into meatballs. Combine all ingredients except the cheese in a large bowl, and gently combine with your hands. Divide the meat mixture into sixteen equal pieces. Take one piece of the meat mixture and flatten slightly into a patty. Place about a half tablespoon of the onions and one cube of cheese in the center of the patty and wrap the meatball around the onions and cheese, sealing as best you can. Repeat with the remaining meat, onions, and cheese cubes. Heat the oil in a skillet over medium high heat. Add the meatballs and brown on all sides. Whisk together the sauce ingredients and pour over the meatballs. Place in the oven and bake for 15-20 minutes. If you are not using an oven-safe skillet, transfer to a casserole dish before pouring over the sauce. Sprinkle the shredded cheese over the meatballs and return to the oven for another 15-20 minutes, or until cooked through, then place under the broiler for 2-3 minutes, or until the cheese is browned and bubbly. 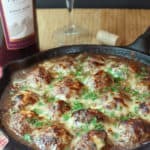 0 Response to "FRENCH ONION SOUP AU GRATIN STUFFED MEATBALLS"